An acronym for Academic and Sporting Inspired Routes to Excellence, ASPIRE believes that professional clubs miss out an home grown talent, particularly in this age group. Many young players begin to encounter other distractions, while professional clubs tend not to concentrate much of their resources on these ages. Based at Bacon College, Rotherhithe, in the shadow of Canary Wharf, ASPIRE serves not only as a means for evolving the youth infrastructure of Dulwich Hamlet, but as a launch pad for talented individuals from disadvantaged backgrounds, ensuring that they undertake a full-time academic or vocational course. While the academy seeks to mould footballers, Rose believes there is also a duty to mould young men. He speaks glowingly of the academy’s “good and humble boys”, including ex-students George Elokobi and Simeon Jackson, who have both risen to the highest level. When current members of the Dulwich side talk about a “Gavin player”, they mean a hard-working, modest young man without any attitude problems. Jackson, a Canadian international, played for Norwich City in the Premier League before he was released in 2013. He now plays for Coventry City in League One, but the 27-year-old admits that he wouldn’t have reached this stage of his career without the guidance of Rose and ASPIRE. 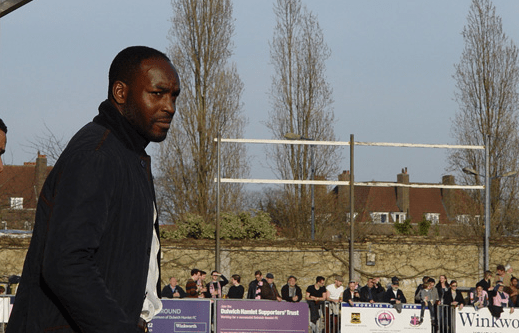 The Jamaican-born striker moved to England in search of a football career in 2002, and was sent to ASPIRE after being released by Gillingham, so empathises with young footballers trying to make their way professionally. He said: “A lot of players end up having to find their own way and it’s difficult. I think ASPIRE is a net that catches those players and gives them the platform to make it, because there’s a lot of great talent out there. The proof of ASPIRE’s success lies in the numbers; the programme has reached out to over 200 youngsters, over 50% of whom have undertaken degree courses at Higher Learning Institutes. Ninety have gained contracts at Non-League clubs while 21 have gone into professional football. However, perhaps the most refreshing statistic is that in excess of 90% of ASPIRE’s participants have achieved an A-C or Pass grade in their chosen courses. Of the current crop, Rose believes midfielder Xavier Vidal can make the step-up to professional football. The 20-year old, who has been training at ASPIRE since he was 16, was recommended to attend by his PE teacher after being rejected by Charlton Athletic for being too small. Vidal had trials at Huddersfield Town and Bolton Wanderers last season and in December was invited by Birmingham City to train with their U-21s. 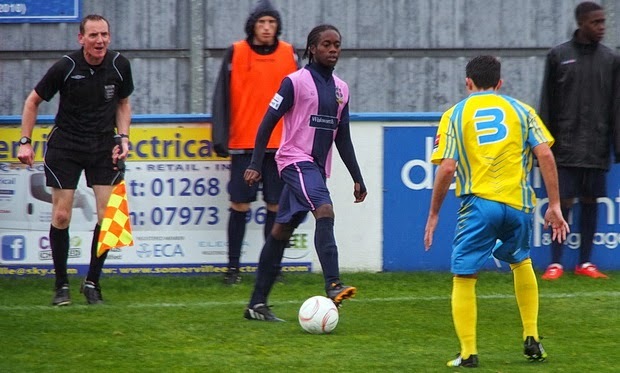 Vidal, born in Peckham, has become a regular in the Dulwich Hamlet first-team since firing the goal that won them the Ryman South championship in 2013, but still trains at the academy as he continues his footballing education. “The football’s quicker at Dulwich and you’ve only got responsibility for yourself, but here there’s a responsibility to lead others on and lead by example”, he explains. Kershaney Samuels is another ASPIRE graduate who features regularly for Dulwich now. He loves the coaching that Rose, and his assistants Junior Kadi and Kevin James, have to offer. “Working with them, guaranteed I’m going to learn something new – either every game or every training session”, he says. It’s this involvement and dedication that has allowed Rose to make ASPIRE a real but underappreciated success story. Dulwich Hamlet benefit from the Academy as a competitive environment for young, hungry players who are eager to take a second chance. If the players impress, that chance will come and they can move on to a club further up the pyramid. It seems rather bizarre that such a successful model should be able to operate, under the mainstream, at non-league level but the FA and the professional circuit could do a lot worse than look to Rose for some lessons in coaching, player and person development. This entry was posted in The State of the Game and tagged ASPIRE academy, charlton athletic, dulwich hamlet, gavin rose, kershaney samuels, simeon jackson, south london, xavier vidal by James Dutton. Bookmark the permalink.